Rockwell diamond indenter or HRC diamond indenter for hardness testing machines. They are used in manual and automatic hardness testing equipment to achieve precise and accurate labeling experiments. The matrix of diamond head (commonly known as head handle) is mostly made of metal materials.The matrix materials used are different according to different hardness test methods and different test conditions and test objects. Most of the matrix materials are made of ordinary carbon steel, high quality carbon steel and stainless steel. 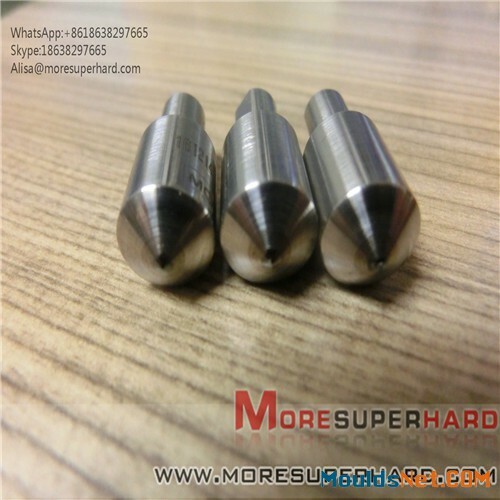 The diamond head or gem head used at high temperature shall be made of metal with high temperature resistance.Now most of molybdenum is used as the substrate of high - temperature head. The base material of ultrasonic diamond head is made of nickel.The matrix material of shaw's diamond head can only be used after special tempering. The rockwell hardness tester is widely used to test various steel materials, non-ferrous metal hardened high-hardness workpiece and hard alloy, etc.Diamond rockwell pressure head can also be used to test the hardness of HRC and HRA of thin workpiece or surface. Diamond vickers pressure head is used to measure vickers hardness of ferrous metal, nonferrous metal, hard alloy and surface carburized layer, nitriding layer, chemical treatment layer, hardened chromium layer, high frequency quench layer and tool surface. The vickers pressure head currently in use includes hv-1, hv-2, hv-3, hv-4, etc. Diamond microheads are used to test the hardness of metal and non-metal parts and mechanical instruments. There are many kinds of microhardness test methods, such as gram's (HK), ge's (HG), etc.The microhardness test method mentioned here is based on the vickers hardness test, which USES a small load (mostly 2-5n) below 100N(10kgf) to carry out the hardness test. 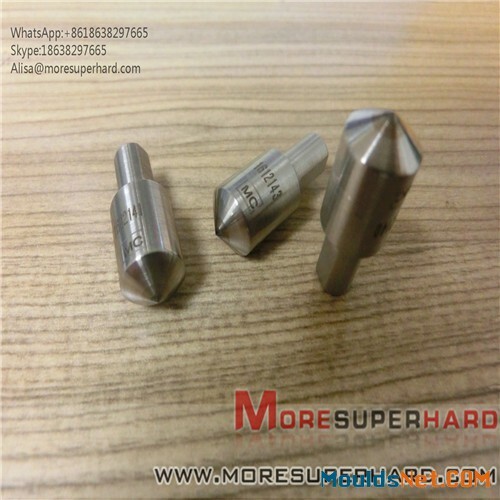 The types of diamond micropressure head are hm-1, hm-2, hm-3, hm-4, hm-5, and the types of kirschner micropressure head are hm-1, hk-2, hk-3, hk-4, etc. 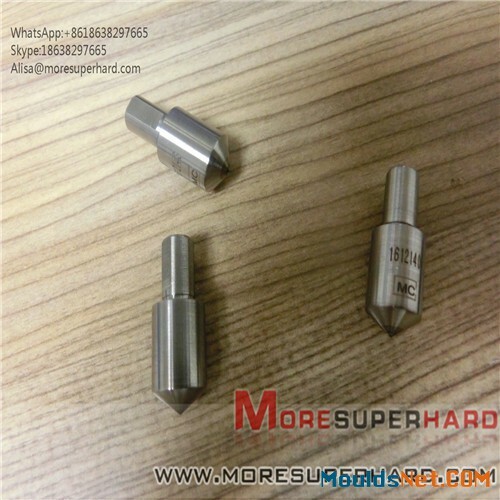 There are other kinds of diamond pressure head, such as xiao's pressure head, ultrasonic pressure head, high temperature diamond pressure first. The geometrical shape of diamond rockwell head is mainly cone. Fixed hardness tester diamond head: cone apex Angle is 120., the error is not greater than + / - 30 ', the difference of measurement angles in two mutually perpendicular directions is not greater than 15 ', the radius of the cone tip circle is 0.2mm, and the error is not greater than + / - 0.01mm. 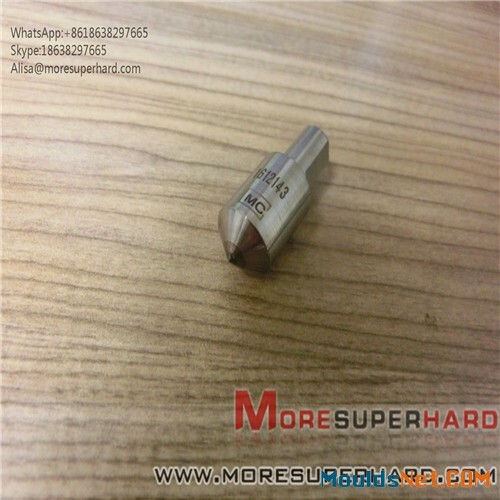 Carried diamond pressure head: 90 top Angle., the error is not greater than + / - 10 ', the tip radius of the cone is 0.1mm, and the error is not greater than + / - 0.01mm. The geometrical shape of the roof Angle of the vickers head of diamond is a pyramid (or quadrate), and the Angle between its two opposite faces is 136.The error is not greater than + / -30 '. The four cone surfaces of the angular cone intersect at one point, which is called the chisel. The top chisel of the vickers pressure head is not greater than 0.002mm. The geometrical shape of the microcrown Angle of diamond was positive square pyramid, and the relative Angle was 136.The error is not greater than + / -20 ', the four cone surfaces of the angular cone intersect at one point, and the top transverse edge is not greater than 0.001mm. The geometrical shape of the crown Angle of diamond is diamond, and the Angle of the diagonal of its relative long edge is 172.The relative Angle of the diagonal is 130.The four dimensional surface of the zhombic zenith Angle intersects at one point, and its top transverse edge is not greater than 0.001mm. The insert welding of the diamond head usually includes two aspects. First, the diamond is embedded at the top of the matrix of the head head according to the specified technical requirements.The other is to weld the embedded pan diamond firmly with the substrate of the head, forming a whole, usually called welding.However, due to the fact that diamond has some properties of iron repellency, it is difficult to weld with metal materials. Therefore, when welding with matrix, diamond should be firstly embedded, while welding materials only fill the position of inlay.When welding, the welding material should be integrated with the metal matrix, and be able to infiltrate all the voids, so that the welding material can firmly enmesh the diamond, making it hard to loosen.